Nine-year old Vivienne Harr and her Make a Stand Lemon-aid have already inspired millions of people to join the movement to end child slavery. Now the message will reach millions more around the world through a hauntingly beautiful and compelling feature documentary, #standwithme. In addition to Vivienne’s story, the film also educates viewers about child slavery through the work of acclaimed photographer, Lisa Kristine, and two organizations with a global reach: Free the Slaves and Fair Trade USA. #standwithme opens in February 2014 with a 30-city tour of North America, and there’s no doubt that this powerful film will earn broader distribution and reach a worldwide audience. Midway through #standwithme is a poignant scene showing a meeting between Vivienne and our very own Olga Murray, NYF’s Founder and Honorary President. Nepal Youth Foundation is one of six organizations selected to receive a portion of Make a Stand’s gross revenue. 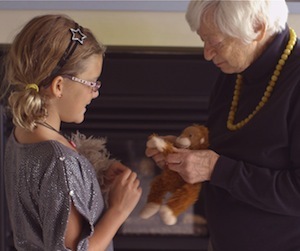 It’s heartwarming to see 9-year old Vivienne and 88-year old Olga talk about their shared passion for ending child slavery. We’re honored that Nepal Youth Foundation is included in the film, and we congratulate Still Motion on their remarkable accomplishment. Read why Make a Stand Lemon-aid is supporting NYF.